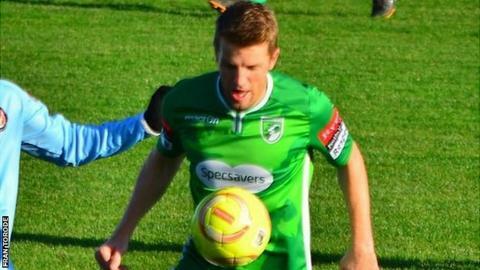 Guernsey FC were "fantastic" in their 2-0 win at Sittingbourne, according to manager Tony Vance. Matt Loaring and Dominic Heaume scored in either half to move the Green Lions up to 16th place in Isthmian League Division One South. "It was a fantastic performance, a comfortable win in the end and we should have perhaps put them out of sight," Vance told BBC Radio Guernsey. "Considering the players we haven't got, it was fantastic," he added. Guernsey have won two of their last three games, which have all been away from home, having struggled over the past two months off the island as injuries and work commitments hit Vance's squad. "The lads deserve it. This is our third trip away in a week, it's so demanding it's untrue. I don't think people appreciate it until you have to do it," Vance said. "At Christmas time, the lads are giving so much of the holiday period when other things will be on their and their families' minds, so to get three points and a clean sheet away from home is an ideal Christmas present for everybody. "We've had a horrible away run recently and some poor results, but over the last four weeks - bar the home game with Walton Casuals - performance levels have been a lot better considering the logistic issues we always face. "It's been a really crazy season for us with the injuries and things like that.